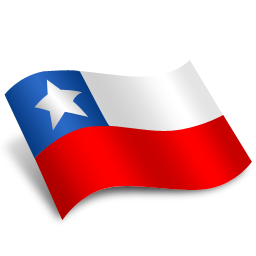 The National Day of Chile is on the 18 September. The first Government Junta of Chile was created in 1810. Below you will find more information about Chile. Chile Fashion is has always been described as being a festive fashion. Chilean traditional clothing has always been very closely associated with such garments as the ponchos, pants and also coats. The Chileans of South America have always been very proud of their traditional dress. The traditional dress of Chile is still very much a fashion statement in Chile moreso than a designer label dress. The Chamanto is also a traditional wear which has been mainly worn in central Chile, the look is very similar to the traditional poncho however the traditional fabric used is silk which has been woven with a thread and wool. The outline of the dress is decorated with frilly ribbons. The biggest difference between a Chilean Chamanto and any other traditional ponchos in chile is that they reverse colors on sides, one side has a light shade and the other side dark. Conventionally, the side of the dress in dark of the poncho is mainly worn during the day and the lighter side mainly again at night. Even though as a people they are very fashion conscious and normally wear very formal attire most times, they are well aware of being comfortable all year round with the seasons in any part of the country. The Chamantos had its highlight as a world fashion when it was worn by the ambassadors of APEC in 2004 Summit. 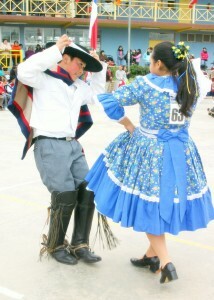 The national dress of Chile is known as the Cueca. 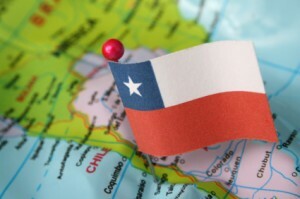 The language in Chile is mainly Spanish and it is Chile’s official language today. There is also English, German and many native languages spoken in Chile outside of Spanish. The languages spoken in Chile have their own indigenous accents which typical show of the heritage of Latin America. If you have been to chile you will note that they speak Spanish with an accent very similar to other Latin Americans in the region. The Chileans view their official language, Spanish as “Castellano” or Castilian but do not view this as “Espanol”, which they are happy to point out to you when asked. They speak Spanish or Castilian with their own accent which have developed over time also with mannerisms unique to Chile. This is viewed in Latin America as Chilean Spanish. Even though the language has similarities with Spanish over the years like other Spanish dominated countries of old they have developed their own distinctive pronunciation, vocabulary and grammar. English is normally taught at school and is now being used as a language for all international business in Chile. Due to its past Southern Chile is enriched with thier own German heritage so some do speak German. There are also many native languages such as Mapudungun which is spoken by the people living in the coastal areas of Itata and the Tolten Rivers. There is also Aymara which is spoken by the inhabitants in the North of Chile. They have over the years preserved their rich Latin American culture but also changed their native languages in such a way that are now quite understandable by most everyone. If you need more information and are British then you can contact the British Embassy in Chile for more information.